When I strolled through Cedarvale Park last week, it was hard for me to imagine that the leafy ravine was once destined to become polluted and congested with high-volume traffic, much like the mess that is the Gardiner Expressway this summer. But, despite how hard it is to picture today, this would have been reality if 1950s urban planners with a short-term vision for the city got their way. Cedarvale, which I call home, is an early twentieth-century neighbourhood, built by Sir Henry Pellatt of the nearby Casa Loma, would most certainly have a completely different character should the Spadina Expressway have been built. The Annex, along with parts of U of T's campus, would have also shared in this fate, and the Spadina Museum (next door to Casa Loma) would have been demolished. Nearly 40 years later, the Spadina Expressway controversy is a reminder of the post-war clash between the interests of inner-city dwellers and the values of suburbanites -- one which arguably remains to this day -- and of a redevelopment philosophy that could be summarized as "to hell with the old...bring on the new." In The Shape of the City: Toronto Struggles with Modern Planning John Sewell, a former mayor of Toronto and one of the key activists in what became a grassroots movement against the highway, writes that the as the former wanted to protect their neighbourhoods, the latter desired an easy access to downtown, where a vast majority of them worked. 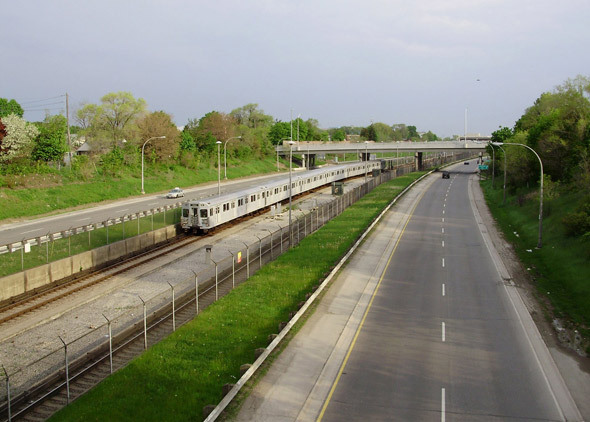 Like elsewhere in North America, a good chunk of Toronto's middle class moved away from the inner city to the urban fringe and beyond, relying on cars to ferry them from their remotely located, under-serviced and often unsustainable, suburban communities. These two opposing visions for the city were reflected in the Metro Council and the Toronto City Council. Not surprisingly, the suburban councillors were all much in favour of the highway, while the majority of the Toronto councillors opposed it. 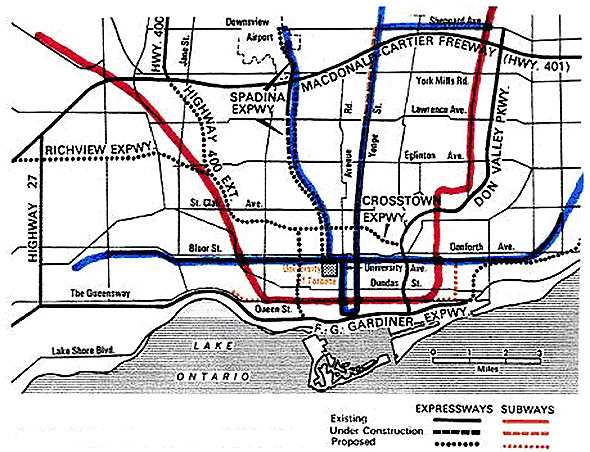 The Spadina Expressway was one of a series of planned highway routes for the city, which included a Highway 400 extension, Scarborough, and the Crosstown. All of them were to culminate in the centre of the city. Nearly a thousand houses were to be demolished and in their place new parking lots were to be constructed. To Sewell and others, this plan did not simply mean getting downtown faster; it was really a "remaking [of] the city in a radical fashion." Those opposing the Spadina Expressway banded together in a coalition called Stop Spadina Save Our City Coordinating Committee (SSSOCCC). 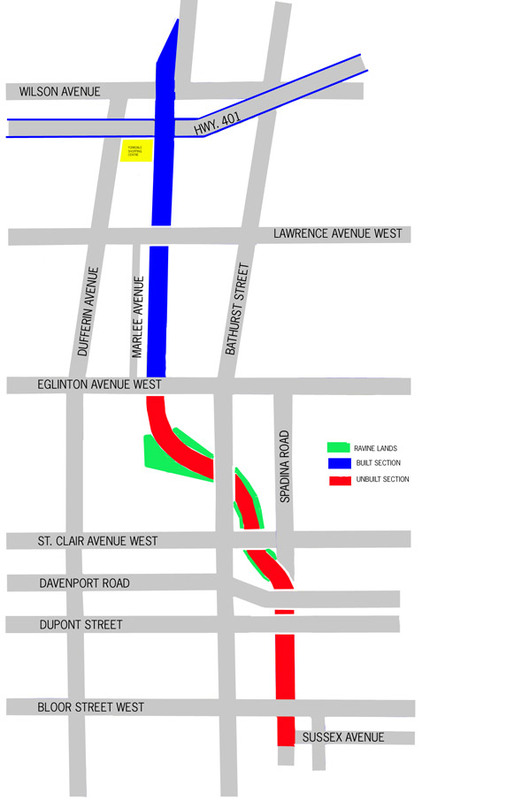 It was organized in the 1960s by Alan Powell, a U of T professor, and its membership included Jane Jacobs (who resided in the Annex) as well as practically every social group who was affected by the potential appearance of the expressway. The group lobbied powerfully for several years, organized demonstrations, crowded political meetings, and researched links among various politicians to the highway. The Spadina Expressway became the election issue in 1969, and Sewell, a member of the SSSOCCC, was elected to the Toronto City council. In tune with other councillors who stood against the erection of the expressway, he vowed fiercely to continue to oppose the expressway at the Councils and to take the fight to the provincial government if necessary. 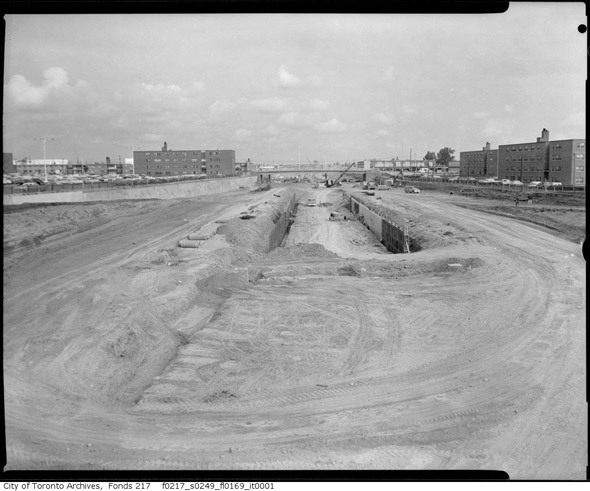 The Spadina Expressway was fortunately never completed, and the part that did get built was renamed W. R. Allen Road. However, before Bill Davis, the provincial premier, halted the construction in 1971, a giant ditch was dug up in the north end of Cedervale park, which served as a reminder of how closely it came to destroying the essence of the inner city. Other bits of evidence of the planned expressway also remain elsewhere in the city. As Mark Osbaldeston notes in Unbuilt Toronto: A History of the City that Might Have Been, the facade of U of T's New College that faces in Spadina is windowless (builders anticipated an ugly view), the lawn at the Toronto Archives sets the building far back from the street to accommodate the expressway that was thought to be coming and the Ben Nobelman Parkette just south of Allen Road's termination at Eglinton was built on land that had been acquired for expressway's path south. In fact, in 1985 the province leased the city a three feet deep by 750 feet long tract of land in the same area just to ensure that Metro couldn't somehow find a way to continue with the highway. This narrow strip serves as a mostly symbolic blockade, but an important one for those who cherish neighbourhoods like Cedervale and the Annex. Image Credits: Early stages of construction Toronto Archives (series and fond information at bottom of photo), all others from the Wikimedia Commons.